Marrenon has unveiled Lez’Arts, a new Luberon rosé available for the UK off-trade. The newcomer has already secured a listing with Majestic nationwide and the wines will arrive in stores later on this month. The wine will be available in a magnum bottle as the producer said the format – particularly for rosé wines from the South of France – is seeing growing demand from UK wine drinkers. Lez’ Arts is a blend of Grenache noir and Syrah grown in high vineyards planted in a cooler lcaotion on the Luberon mountain area. The wine has a pale pink colour and an aromatice nose, showing notes of red berries, citrus fruits and grapefruit aromas. Lez’ Arts is described as a “balanced wine with a long and fresh finish”, and it is said to be ideal as a match for white meat, sushi or roasted fish. 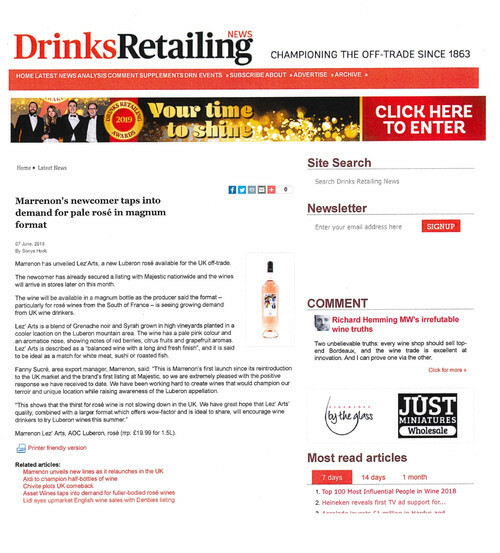 Fanny Sucré, area export manager, Marrenon, said: “This is Marrenon’s first launch since its reintroduction to the UK market and the brand’s first listing at Majestic, so we are extremely pleased with the positive response we have received to date. We have been working hard to create wines that would champion our terroir and unique location while raising awareness of the Luberon appellation. Marrenon Lez’ Arts, AOC Luberon, rosé (rrp: £19.99 for 1.5L).